Employers such as Career Center Partner GROWMARK and many others from across the country attend career fairs seeking Redbird talent. National groundhog Punxsutawney Phil predicts spring is soon on its way. As spring approaches, many students begin thinking about employment after graduation, and many alumni may be considering a career change. To help Redbirds with their careers, the Career Center is hosting its Spring Career Fair and Education Career Fair. The Spring Career Fair, held on February 26, will be in the Bone Student Center’s newly renovated Brown Ballroom. The fair connects Illinois State students and alumni from all majors seeking full-time positions with employers seeking to hire Redbird talent. Over 115 organizations are registered to attend the fair. These employers represent a number of industries, including Fortune 500 companies, small businesses, local businesses, hospitals, and government agencies. Career Center Partners such as Caterpillar, C.H. Robinson, Cintas, COUNTY Financial, Enterprise, GROWMARK, and Liberty Mutual are just a few of the companies attending. Non-profit organizations such as Chestnut Health Systems, Easter Seals, Illinois Department of Human Services, MarcFirst, police departments, and a few school districts are also registered. 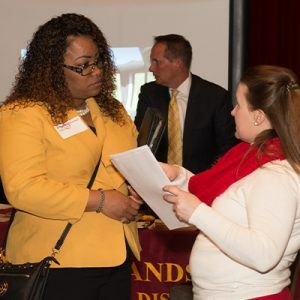 Also held in the Bone Student Center’s Brown Ballroom, the Education Career Fair on March 5 connects school administrators, superintendents, and other employers from the field of education seeking to hire candidates in education and related fields for open positions. Nearly 150 employers are registered including local school districts, those from the Chicagoland area, and other areas across the country. The Education Fair is not only open to teacher candidates, but also for other majors that work within the education system. To help students prepare for the Spring Career Fair and the Education Career Fair, the Career Center provides résumé reviews and interview tips. Students can make an appointment with their career advisor, or by stopping by the Career Center during drop-in hours for helpful advice and support. The Career Center also hosts Late-night Resume Reviews from 8–10 p.m. on various dates before the fairs on the third floor of Milner Library to provide individual résumé reviews-constructive feedback from highly trained career ambassadors, who are also their peers. “Attendees should also review the list of employers attending our career fairs and research them before the event so they are familiar with the organizations, identify if they are a good fit, and to be able to answer employer questions effectively,” said Mike Minton, Career Center associate director for Student Relations. A complete list of employers attending the fairs and details about them are available on the Career Center website or through Hire-A-Redbird. Resume reviews, like those held at Milner Library, are highly encouraged by career experts. Prepare for on-the-spot interviews. Visit InterviewStream to get interview questions listed by major and job industry, and practice your answers. Develop a 30 second summary of your professional skills, experience, and interests. Then, identify your answers to common interview questions. A list of sample questions are available in the Career Resource Guide. Dress professionally. A business suit is recommended. Create a profile in Hire-A-Redbird: post your résumé, identify positions and to apply for them. If you already have your profile created, be sure your information is up-to-date. Order free business cards to distribute to employers and print out a résumé on free paper at the Career Center. To provide education majors with additional support, the Career Center is hosting Hiring Tips for Education Majors. This program introduces students to some of the school districts attending the fair who will provide advice on how to navigate the application and interview process. “It’s also a great opportunity for students to meet employers and build connections,” states Carrigan. This fall, the Career Center will introduce its first Fall Education Career Fair on November 5. The purpose of this fair is to allow employers an opportunity to meet potential candidates and get a jump-start at identifying, and possibly hiring, talent early. Employer registration opens soon, so employers are encouraged to save the date. A new season brings new hope. For Redbirds, the spring is not only about a weather change or graduation, but also about starting a great career and a season of career success. The Career Center supports Illinois State University’s Educate Connect Elevate: Illinois State—The Strategic Plan for Illinois’ First Public University 2018-2023 by assisting students with developing, evaluating and/or implementing career, education, and employment decisions.